Familiarity breeds contempt in sports rivalries, but in some cases it can also breed repetitive dullness. For the Pittsburgh Penguins and the Washington Capitals, who have met in the playoffs each of the past three seasons with the victor going on to win the Stanley Cup, there was a looming possibility that both teams might eventually run into the law of diminishing returns in their match-ups. But if Wednesday night’s 2-1 Penguins win was any indication, the intensity of Capitals-Penguins will not cool off in the Crosby/Ovechkin era. If you think you’re tired of this series, and if you think you don’t want to see this playoff match-up happen again, you are very, very wrong. These teams had already shared a 7-6 OT thriller early in the season (won by the Penguins), and the Capitals struck back with a dramatic T.J. Oshie winner in their second meeting in November. But Wednesday’s game felt like a true playoff preview, with both teams riding first-class performances from their number-one goaltenders in a brutal game that swung on just a few bounces. This was a rare regular season hockey game that actually meant something. The first period would pass without either team gaining an edge, but in the second, the Caps broke through on a beautiful 2-on-1 rush by Wilson and Lars Eller, with Eller finishing off the icebreaker. Just a few minutes later, the Penguins knotted it up with a powerplay Crosby deflection off an Evgeni Malkin shot. Late in the period, Pittsburgh would earn themselves the game-winner by capitalizing on a failed Washington clearance attempt and creating a mad scramble right in front of the crease that led to a Bryan Rust goal. The Capitals didn’t go quietly, forcing Penguins goalie Matt Murray to make plenty of stops in the third. He held strong, and even the ones Murray couldn’t quite stop still didn’t make it in the net. 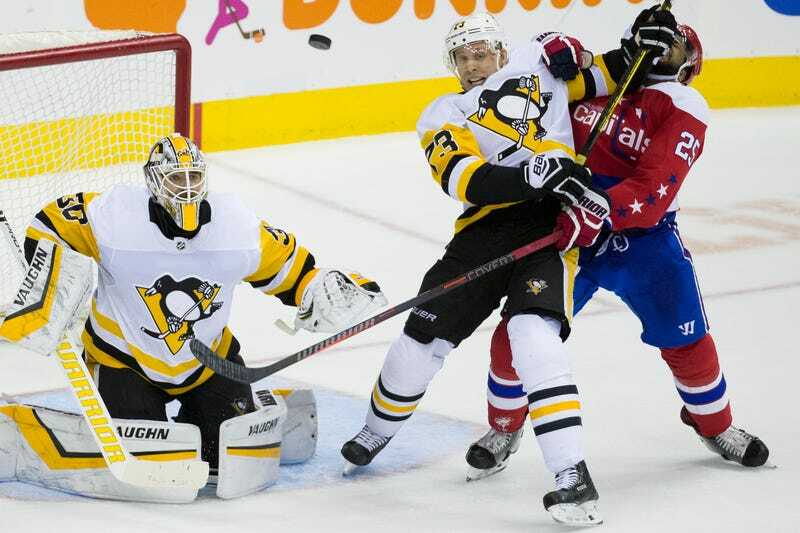 A power-play wrister by Evgeny Kuznetsov ghosted through the netminder but ended at the post, and later in the period, newly acquired Penguins defender Marcus Pettersson made himself a hero by diving spectacularly to clear a puck off the line. Following the failed final-minute charge, Ovechkin—who had scored 10 goals in his last six games—got out his frustration by busting up his stick on the bench. A 14-year veteran shouldn’t take a close loss in December this hard, but Ovechkin does when it’s against his nemesis. It’ll only get more emotional when these teams inevitably meet again in late April.